If you're just here for a "How-to," only read the sections between the lines. Isn't he adorable? I happen to love sheep (particularly cuddly ones), and I gushed when I saw this little guy. momomints, the creators, actually offer the pattern for this little guy free on their site, here. Even cooler than that, they sell a kit which comes with everything you need to make this little fella, so you don't have to buy huge bundles of yarn (a.k.a. skeins, thanks mom for drilling that term into my head) when you only need a tiny amount. They even include the cute little bell!. I impulsed-bought the kit (available here) and it arrived a couple of days ago, and I quickly realized I was in way over my head. I knew I'd have to go buy crochet hooks to make him, but I didn't even know how to crochet! Let alone follow the crazy jargon of a pattern. Yup, that's it! But don't worry, I still managed to muck up that much. I thought I'd be practical and buy a skein of yarn that I'd be willing to use (wear) in a project down the road, but that I could practice with in the mean time (so no fire-engine craft yarn red). Thus, I picked a soft acrylic of a natural tone (pictured below). This wasn't a bad idea in concept, however the yarn itself is very fuzzy, like REALLY fuzzy. It was hard to make out what was and wasn't a stitch when I tried working with it. 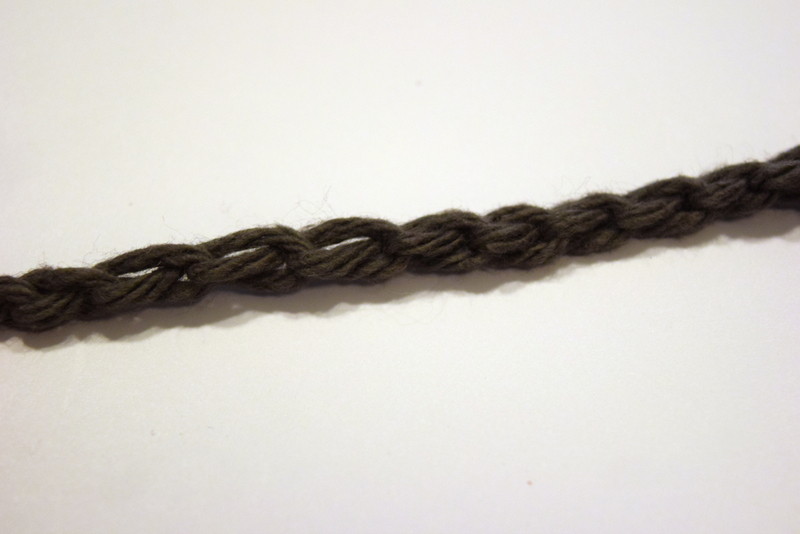 It's not very tightly wound, it got caught on itself, and was basically a mess for a less-than-novice to work with. It was also a bit heavy of a weight, which might or might not be more difficult to work with, I think it just depends on your style. A nice yarn, but bad to practice with for beginners! A comparison of chain stitches on the first yarn I bought (below) and the cotton yarn (above). It was MUCH easier to make out the individual stitches in the cotton. I played with this yarn for a bit and had eaten several tufts of fly-away fluff before I gave up in frustration. Back to the store I went; I wanted a slightly thinner yarn this time (one guide said 4's were good, so I went with that), and I did my best to find a color that was still wearable but might tighter and less fray-ish-y (I'm really putting this English degree to work!). I picked an (unfortunately more expensive) 100% cotton yarn. It was MUCH easier to work with. A yarn's weight is how thick it is (not how much there is!). The lower the number the thinner the yarn, the higher the number the thicker. 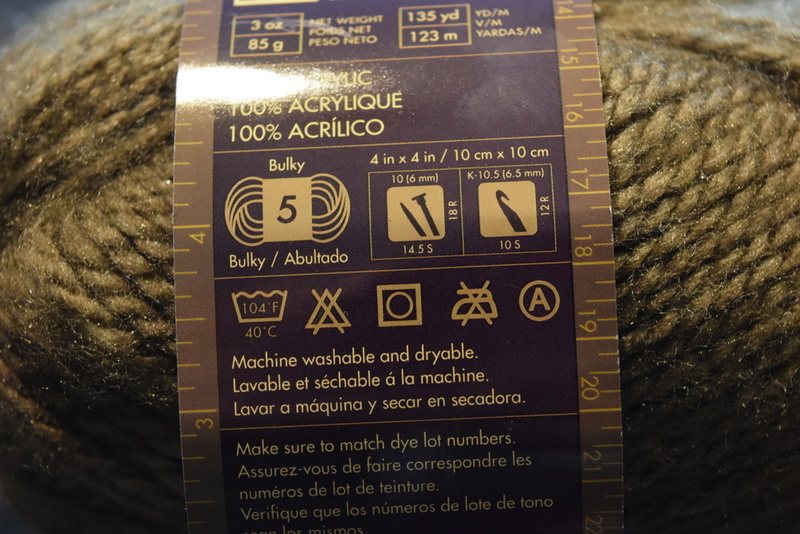 If you're looking at skeins in a store (a skein is just a bundle of yarn), flip it over and on the back of the label should be a number, for example "5 - Bulky." Near the weight it'll also say two other sizes, one with a picture of two needles and another with a hook. For crocheting, you want the hook's number (the other is for knitting). Typically it says a letter, a number, and another number in millimeters (mm). All three are different ways of referring to the same needle (e.g. an "H" needle is a #8 and a 5.0 mm one). On some conversion charts the letters to mm's vary slightly, so when in doubt just match your needle to the label of your yarn. Don't worry if you're a bit off, the sizes are just recommendations! Click for a closeup of the fuzzy yarn label, crochet info is on the right! I came across a guide that actually recommended getting wool if you're a beginner (of course I didn't read this until after my second trip to the store). The advantages of wool vs. cotton is that wool has a bit of a stretch to it. Cotton, being stiff, has no give when you're trying to pull the hook through. Even so, I think the fuzz-factor has a bigger impact, so just take a good look at your yarn before you start! The yarn I ended up purchasing is this Bernart Cotton Delux Yarn. Click the label to see all the info. Amigurumi - Crocheted stuffed creatures like Fluufie the sheep or Oliver the Oliphant. As for what hooks to get, pick ones that fit your yarn (see the note to the right), and fit your potential project if you have one. You can also usually get a set of average-sized hooks in a pack (like F - K) cheaper than buying each individually. Since the Fluufie sheep needs two different sizes, I opted for the pack. I ended up buying a set that came with a book for beginners, six hooks, two yarn needles, stitch markers, and some hard ring thingies. I needed yarn needles too, so the set was actually cheaper than buying individually, (and found out later how helpful the stitch markers would be!) although I should mention that the book it came with is absolute crap. Uhhhh... How Do You Hold It? Please don't over-think this! The two basic holds are the pencil hold and the knife grip. They're somewhat self explanatory; the pencil hold is when you hold it like a pencil or a paint brush and you use your fingers to turn the hook; for the knife grip, hold it like a knife, with your hand over the hook and use your wrist to turn it. Try out both and pick whichever is comfortable. You can try switching while practicing, but if you switch in the middle of a project you run the risk of uneven stitches. I thought because I paint I'd like the pencil hold, but it made my hand ache a lot, so I switched to the knife, and now use that mostly. Holding the yarn is more complicated, but also more freestyle. My best advice is just to play around with it until you find what works best. Some people wrap it completely around another finger before running it over the pointer finger, I don't like this. For me, I just weave it through my four fingers on my left hand, over the fore, under the middle, over the ring, under the pinky. The goal for any style is to maintain a workable tension where the yarn is held taught, but still easily manipulated. Most of the time when you're crocheting you'll start with a slip knot. However if you are learning crochet to predominately make amigurumi, that first sentence is a lie. For most parts of amigurumi you "crochet in the round," but I'll cover that in a "Crocheting in the Round" post soon. Feel free to skip to down to the single crochet section, as standard rows won't be much use to you unless you need not-round pieces (like ears). The order of stitches in this post is typical to what you would follow for most "row" projects, for example a scarf or a pot-holder. At first, I didn't get that a slip knot was a "thing," I thought you just tied a basic knot at the end of your yarn. This is very wrong. Sifting through the numerous guides, many suggest you hold the yarn "here," grab "here," pull "here," etc. They're all pretty confusing, but this video on the wikiHow How to Crochet page (about halfway down) is the best and easiest method I found. Unfortunately the rest of the page is somewhat confusing. For the knot: wrap the yarn around your finger and pinch the tail with your thumb and middle finger so it's taught. Place the hook (the shaft of the hook) under the yarn, pull up slightly and spin the hook around, doing a 360°. Now grab the yarn ahead of the loop on the shaft, using the actual hook part, and pull it through the first loop you made, and then pull on the tail to tighten, but leave the loop on your hook a little long, as this will be the size of all your stitches. Voilá, you're ready to begin! Yarn Over - The term refers to the correct way to put the yarn over the hook before you pull it through a stitch. If you "yarn under" instead, it still works, but your yarn actually ends up twisted. I will say however that I usually forget if I'm doing it right or wrong, and you really can't tell the difference once the stitch is complete, so don't worry about this until you're past the novice stage! Here's my fifth(?) attempt at crocheting a chain, as you can see they're very loose and uneven! Don't get discouraged, keep trying! Before you move onto the next step, make a chain of some number of stitched (you want a fair amount to practice with, so stick in the range of 7-15). Also it's worth noting there's a front and a back of the chain. The front is the side that looks all like V's, the back has bumps in the middle of the stitches. Most of the time the next step is working into the top stitch on the front, but occasionally patterns will call for working in the other loops, so it's worth keeping in mind. 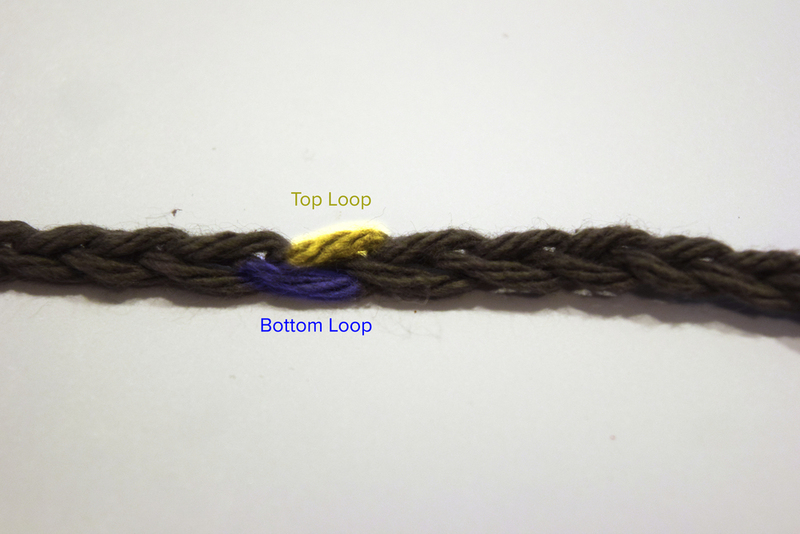 Front of a chain, top and bottom loops of the same stitch are highlighted. Wohoo! You're ready to start crocheting! There's several different types of stitches but single crochets are the smallest and the most simple of your standard stitches. I'm going to post the video first (another Lion Brand & HowCast) and explain any confusing parts after. How you work into the chain is actually the same for all basic stitches, what changes is the number of times you yarn over and pull through. When you skip the first chain to work into the second, not only are you keeping that last chain intact, but you're also actually setting the "height" for the row. Each standard stitch has a height, singles are one, half doubles are two doubles are three, triple (aka trebles) are four. What this means is that you need that many chain stitches to set the height of the row, so for single crochets you work into the first stitch after the one next to the hook, double crochets are done into the third (so you skip!) and trebles are done into the fourth, skipping those three plus the first). This is important because if you worked a treble stitch into that first stitch away from the chain, your work won't have even sides or nice corners at the end. Some projects might actually call for that, but if you wanted a nice straight scarf or square pot holder, you need to count the right number. When you've worked a single crochet into the last stitch of your chain, move on to the next section. Remember all that stuff I said about height? Here's when it's really important! After you've done the last stitch in your first single crochet row, chain the number of stitches to match the first stitch of the next row (probably just one if you're still practicing). If you're working on a project, check what the pattern lists as the first stitch of the next row. It's also worth mentioning that in a pattern, chain stitches at the ends of rows are not always counted, sometimes a pattern mentions them, sometimes it assumes you know to do them, and also sometimes it will tell you to do more or less than the usual number, to garner a different effect. But normally, if you've finished a row of single crochets and your first stitch of the next row calls for a double crochet, you'd chain three. After you've chained the number you need (probably just one at this point), you literally turn your work around. Now you stick your hook into the top loops of the last single crochet stitch you did, which the video to the right will show you. Once you've completed that row you can keep single crocheting and turning at the end of the row to make a very basic scarf! Here's my very bad attempting at doing a few rows, I think I got worse as I went on. You can see how varied my stitches are by all the big holes, so don't be discouraged, we all have to start somewhere! The last stitch I'll cover in this post is the slip stitch. It's often used as the last stitch to close off your work, but it can also be used to vary the shape of the work. For example in amigurumi, which is often done mostly in single crochet, slip stitches (and even combined with double stitches) can make crooks or bends in animals that aren't perfectly round, or join rounds when needed. Slip stitches are a lot like single crochets, I actually almost think of them as half stitches. To work a slip stitch, begin like you would with a single crochet by placing your hook under the next stitch and pulling the yarn through the stitch, however you then keep pulling the same strand through the other loop on your hook without yarning over again first. If you wanted to close off your work you could then cut the yarn and continue to pull the loop on your hook until the tail is pulled through, and then pull the knot tight. I've broken down a couple of patterns (one is posted, the other will be up soon!) to simplify them for beginners, but here's what you need to know. st = stitch (this usually is used to tell you how many total countable stitches there are in a row, and sometimes it's used with the other abbreviations below to form a phrase. For example, sc st = single crochet stitch. dec = decrease stitch, this is when you work one stitch of your current row into two stitch is the previous row, thus decreasing the total number in a row. inc = increase stitch, the opposite of a decrease, this is when you work two stitches into the same stitch of the previous row, thus increasing the total number. When in doubt, use some math to check your work! For example if a pattern reads 5 ch for the first row, and then 5 sc the next, the pattern isn't counting the first chain from the hook as a stitch, so you actually need to have six chain stitches in your foundation to have a place for every single crochet. The same works for increases or decreases, one increase will actually produce two stitches, and one decrease stitches two together so you'll have one less than the previous row. The terms for stitches actually very depends on where you are, so here's a break down of American terminology vs. British. Neither of them really make sense to me, but somewhere on your pattern it will say which terminology it's using, if it's not otherwise obvious. For example if you're reading a pattern an American (like me!) posts, you can relatively safely assume it's in the American style. I learned this the hard way, if you work your stitches very tightly, not only does it become very difficult to work the next row, you'll put a lot of extra strain on your hand/wrist. Instead, if you really want smaller stitches, use a smaller hook than the one recommended by the yarn. Also keep in mind the type of yarn you're using. If you're using wool, which stretches, it's okay to be a little tighter because the wool will flex and relax as you use it. Conversely, cotton yarn has no give so stitches will stay as loose as you make them. Count Half Stitches: "One, one and a half, two..."
Leave a message in the comments or shoot me an e-mail at neila@neilafitzgerald.com. I'd be happy to answer any questions!